Dropbox integration has finally arrived for Microsoft Office Online. This is the latest integration between the two companies, which previously connected Dropbox to Office experiences for iOS and Android devices. 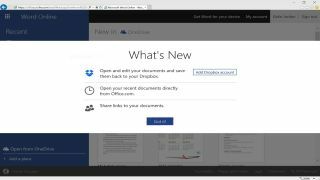 "Now, when working in Office Online you can add your Dropbox account to easily browse, open and edit Office files with Office Online," Microsoft announced in a blog post. "You can also create new files in Office Online, and save them directly to your Dropbox." Prior to today's announcement, Office users could edit documents stored in Dropbox on mobile, but not in the browser. When using Microsoft's web app with Office Online, users can just now hit the Open button to open files stored in Dropbox. This allows users to edit, create, and save files to Dropbox from Word, PowerPoint, and Excel on the web. To use office online, users can visit the Office site to sign on. In addition to Dropbox, Office also integrates with Microsoft's Dropbox for cloud storage access. Today's announcement allows users more flexibility with more choices on where to store Office files. Microsoft has been working hard to deepen its ties with external cloud storage partners for a number of months and to that end it launched a Cloud Storage Partner Program in February. Box, Citrix and Salesforce were the inaugural members and it means their members can open, edit and save previously created documents in Office for iOS and Office Online. Those external services, plus Dropbox, sit alongside Microsoft's OneDrive cloud storage offering that gives 15GB of free storage space for Office Online users. That rockets to 1TB when you upgrade to a full Office 365 subscription that starts at £5.99 ($6.99, or AU$9.00) per month for one PC, one tablet and one smartphone.